The LED driving lights are designed to come on with your ignition and stay on throughout your ride whether it’s day or night, sunshine or rain – and you get extra bright turn signals too all contained within your original turn signal housing. Many bolt-on lights are heavy, ugly and don’t improve the look of your bike. Now with UltraBRIGHTS, you don’t have to spoil the aesthetics of your bike’s design to be safer on the road. We have products available for current bikes and earlier models. Using ultra bright high-intensity automotive LEDs, these 2-in-1 Driving Light/Turn Signal upgrades are the brightest, safest and simplest lighting products available. Designed specifically for BMW motorcycles, our clever products fit right inside the front OEM turn signal housing – no need for brackets, drilling or clamping. Option 2: Amber running lights with amber turn signals. Weiser currently manufactures four different LED panel shapes. It is important that you identify not just the bike make and model you require, but also the shape of the OEM turn signal housing currently fitted to your bike. Take a look at our handy guide before viewing the products for sale. If in any doubt, send us a message or call +1 (831) 713-4365 and we’ll check to see if your model is compatible. The extreme (arrowhead) shape is mainly found on newer BMW, KTM, Triumph, Aprilia and many more bikes from 2006-present. Click here to see products. This slightly more curved shape was mainly used on BMW bikes from 2000-2014. This shape is found only on BMW ‘Oilheads’ from the 1990’s-2004. Model not listed? Send us a message or call +1 (831) 713-4365 and we’ll check to see if it’s compatible. SAVE 10% WHEN YOU BUY THE COMBINED FRONT & REAR KIT! 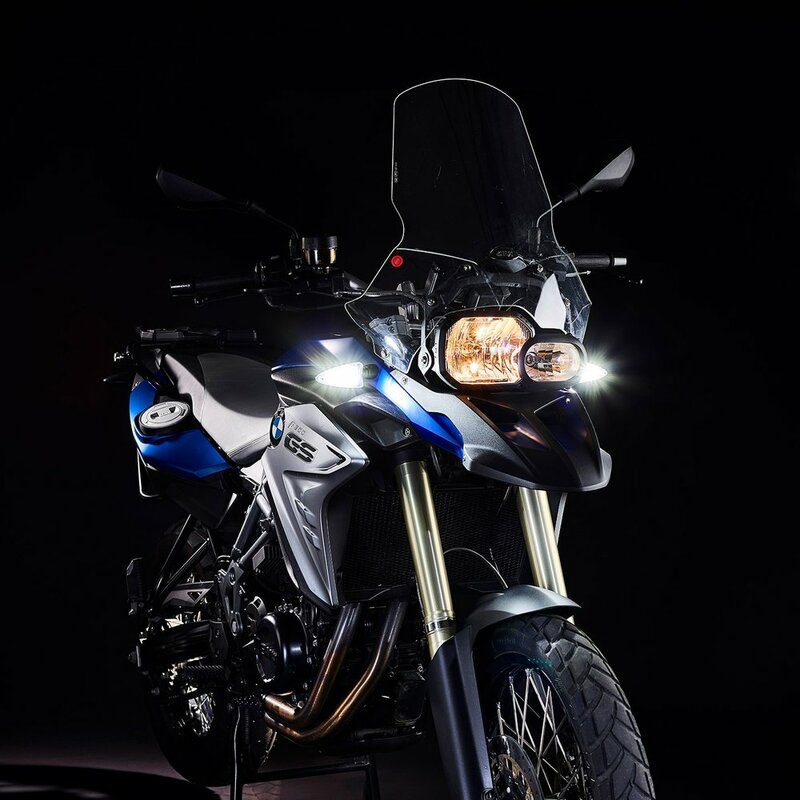 The specially designed LED upgrade is designed specifically and only for BMW’s G 310 motorcycles (with this shaped turn signal housing). The G310 is not fitted with a CAN-bus electronics system and the kit supplied with this product is not suitable for fitting to any other BMW motorcycle with CAN-bus electronics.